In late 1716, Mary's husband was appointed ambassador to the Ottoman Empire. The family travelled overland to Costantinople; en route they spent several weeks in Adrianopke (=Edirne). 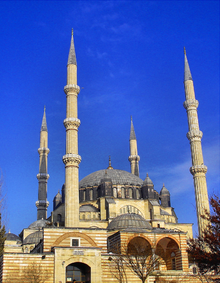 Mary enthusiastically described an incognita visit to the magnificent Selimiye Mosque in her letter of May 17th (O.S.) 1717. These letters were mostly, or wholly, a literary device. They were shaped, after the author's return to England, drawing on material from her diaries. Nobility calls to nobility, landowner calls to landowner, so Mary presents a pretty favourable picture of the Ottoman nobility, despite the enclosure of women, the dominance of lawless janissaries etc. On the other hand, her account (in the same letter) of the Jews, who she says control all the city's finance,... is typical of its era. Antisemitism took its particular character from the diaspora, from the (enforced) landlessness of the Jews. They were citizens of nowhere. In a letter from Pera (Constantinople), Mary expounds an object-letter; a coal means "May I die, and all my years be yours! "; a piece of paper means "I faint every hour!" But she laments: "I am in great danger of losing my English... I live in a place that very well represents the tower of Babel : in Pera they speak Turkish, Greek, Hebrew, Armenian, Arabic, Persian, Russian, Sclavonian, Wallachian, German, Dutch, French, English, Italian, Hungarian ; and what is worse, there are ten of these languages spoken in my own family. My grooms are Arabs; my footmen, French, English, and Germans ; my nurse, an Armenian; my housemaids, Russians ; half a dozen other servants, Greeks ; my steward, an Italian ; my janissaries, Turks ; so that I live in the perpetual hearing of this medley of sounds, which produces a very extraordinary effect upon the people that are born here ; they learn all these languages at the same time, and without knowing any of them well enough to read and write in it. There are very few men, women, or even children, here, that have not the same compass of words in five or six of them. ...."
"Sclavonian" probably means Serbo-Croat. "Wallachian' means Romanian. The book I've read is a 1921 selection edited and annotated by Hilda Chatwin, entitled Letters from Constantinople. Methuen's English Classics were aiming this one at girls in private education. I remember writing once about Adrienne Rich, but the post isn't online now... perhaps I already decided it wasn't up to much. If I ever get to a laptop again, I'll check it out.